A hard earned thirst needs a big cold beer and the best cold beer is Vic. An easy beer to drink. Great flavour and the stubbies are a good size. One of the things I miss most from Oz. You can't beat the authentic taste of VB. The great Aussie beer is a flavourful reminder of the beautiful land down under. I'm just so happy to be able to grab a bottle of my favourite Aussie beer here in the UK. Remember it's called Victoria bitter, but it's really a lager. 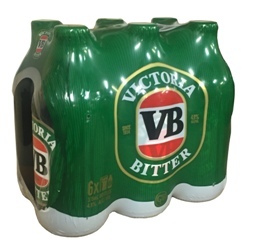 So grab yer thongs, put on your sunnies and enjoy some liquid gold from down under. You gotta try one maaaate! Refreshing beer that I wish was more common in the UK. Will definitely get more for the summer. I was very happy to find somewhere that sells Australia's best selling beer. Developed a taste for VB on a recent holiday. A rich tasy beer, which is definitely more lager than bitter. Take a six pack taster before grabbing yourself a slab. This really is the Very Best beer in the world. It should be sold everywhere! Not only my favourite beer but also my favourite drink! If only we could get it at the aussie price! Its one of the best beers ever!! No i'm not from Frankston!